In the spirit of full disclosure, I devoured this book. I read it in about a day and a half, neglecting things I was supposed to be doing (important things) just so that I could see what crazy thing would happen next. Also, the story was jam packed full of tropes and story arcs that appeal to me. Why was it so full of those things? Well, more on that later, but to be starting out with, all that’s important was that it was ridiculousy readable. 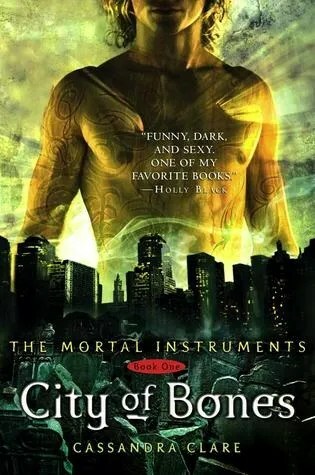 If you’ve read much YA, you probably already know the basic plot of City of Bones. Clary Fray is our supposedly normal teen of choice, and she lives in a fictional version of New York City with her artist mother. Her father is dead (. . . OR IS HE?) and her best friend Simon is secretly but obviously in love with her. She’s pretty, but unaware of it. Her farts probably also smell like roses. Then one night when she witnesses a handsome blonde stranger seemingly murdering someone in a club, she finds herself falling into a hidden world where demons are real, and because she can see them (and the people who hunt them) that means she must be part of that world as well. The young man is named Jace, and he is a Shadowhunter/Nephilim, a half-angel being whose mission is to hunt down demons and keep Earth safe. And Clary is a Shadowhunter as well. Surprise! I read this book after seeing pyrajane’s review which described this book as a book about books for people who love books. And that’s exactly what this book was, and it was delightful. Mr. Penumbra runs a mysterious bookshelf, and our protagonist Clay takes a job working the night shift at the store. 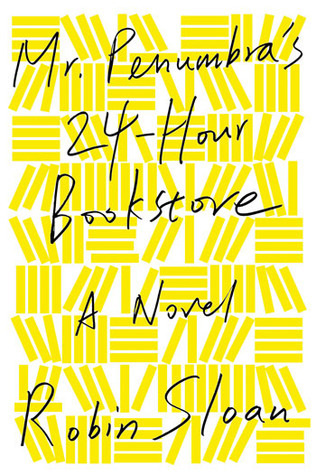 Mr. Penumbra’s requests seem a little unusual, and Clay starts to pay careful attention to the books in the store, the customers who borrow them without paying, and the peculiar tasks he’s required to do. Ultimately, this is a mystery. It’s a worldwide network of people racing to crack a code, and to do it under their terms. You feel the tension between the old school and new school attitudes towards technology as the characters race to the finish. And Clay reminded me a tiny bit of Harry Potter. Based on earlier reviews I read of J.K Rowling’s first post-Harry Potter release, I had fairly low expectations for this novel. It’s definitely not Harry Potter, but I found it enjoyable once I got into it. 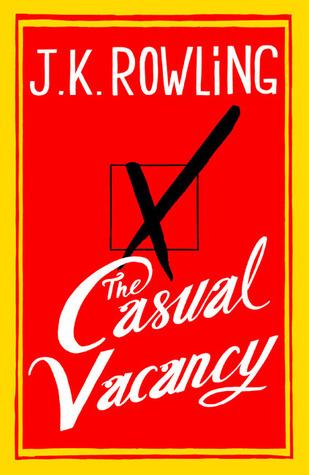 In The Casual Vacancy, a city councilor in a small town dies unexpectedly, leaving an opening on the city council just when a historically contentious issue is coming up for a vote. Rowling builds the town, family by family, neighborhood by neighborhood, local store by geographic landmark, until you almost feel like you live there. Having grown up in a small town mired in its own constant controversies over flood control and developments, I actually kind of liked this novel. The political maneuverings were funny, and interesting, and sometimes its nice to read a book where the stakes are something small like winning a local election rather than saving the world. I related to the town, and to the characters, and the suburban struggles they dealt with.